Moss Hill Farm is a Biodynamic, organically, permaculture, market farm located in urbanville Milton in North Fulton at 13230 Freemanville Road about 1/2 mile north of Milton High School. It is about 1+ acre of intense close companion planting. I use organic, bio-dynamic, co-creating methods of raising healthy, flavorful, wholesome vegetables and herbs. Moss Hills commitment to natural farming practices means NO synthetic products are used, including fertilizers, herbicides, and pesticides. This is a "drug-free", chemical-free farm! The organic biodynamic practices (not government certified) is the customer's assurance that there will be NO Genetically Modified Organisms (GMO), sewage sludge, or irradiation used in the production of these agricultural food products. I have tried to get as close to the way God grows things as anyone can, to produce these vegetables honoring our environment! Our main mission is to grow healthy nutritious whole food for a certain number of families using the CSA method. This frees us up to devote our full time to ensuring as much as possible a fair amount of food for 32 weeks of the year. This provides for the tools, nutrition for the soil, people who help manage, seeds, transplants, improvements, and supports the Keisler's. This year several ‘improvements’ were made. deer), granite dust, rock phosphate, lime, top soil, sand, leaves, weeds, kitchen wastes, and plants from the field. Biodynamic preparations 500-508, BC, Pfeiffers Field & Garden Spray, and Compost Starter are used on a consistent plan to bring Nature's forces into our labor. This is our fertilizer, pest and disease management, weed management, and furry animal management. Balance is pursued not elimination. Bad insects are needed to feed the Beneficial's. Weeds educate on what we need to do to help the soil. Critters bring a balanced life force, but we still put up an electric fence to discourage the deer from coming into the field. Steps are being taken to be gentler on our soil. There is less tilling because it beats the soil, there are more hand tools to work with the soil, push plows to mix in the compost, broad forking and turn plowing to keep the tilth in place and provide extra oxygen for the microbes and earth animals. Last year we partnered with Bret Tenny, who lives a mile north on Freemanville, to teach him to use biodynamic practices to grow on his 1/3 acre farm called Red Rock Farm. His property was used as farm land in the past so it was an easy transition for us to use our organic method for his first year planting. We grew some of our melons, peas, cucumbers, squash, zucchini, tomatoes, corn, beans, peppers, winter greens, onions, and winter squash to add to our CSA last year. This was one of our best things we did last year. He has committed to do this again this year for the CSA members. We get our transplants from a company in Nebo, Tenn. called Banner Landscaping. They are the only certified organic transplant provider I know of in the Southeast. They are 5 hours away by driving so we have them shipped to us every 2 weeks. We will get about 1400 transplants with each order. We also grow some of our own transplants from our cold frames and permanent hoop house. It has been a huge success for us learning how to bare root transplant into the field. We also grow some of our own green onions from seed, the reason we were able to have a member of the onion family almost every week. Our garlic last year was very productive enabling us to make it part of the share almost 20 weeks, no one complained about too much garlic. Kay Keisler, my wife, helps with the herbs, flowers, shareholder pickup, Facebook update, web presence, email updates, and 'gopher' activities for Floyd. She keeps the place uncluttered, grass mowed and cleaned up after me. Most days we get along very well .... :). We are expanding the flower and herb sections at the pavilion, up the hill. What we have been doing is including any of these we grow as part of the CSA. We usually have a sample for you on the day of pickup but you are always free to go harvest as much as you need for the week. We will try to move some of the herbs that the deer and critters will not eat to the hill just above the parking lot. We tried it last year but we were not very successful. We ended up growing the herbs from seed in the hoop house several times, giving out the whole plant. The idea was if you wanted more you could either use the plant or plant it at your home to grow more. 1. Spring shares from April 10th to June 11th for 10 weeks. 2. Summer shares from June 18th to Sept. 3rd for 12 weeks. 3. Fall shares from Sept. 10th to Nov. 12th for 10 weeks. Each share will normally supplement a family of four.... two adults (teens have adult appetites), and two small children, to compliment your family meals for the week. OR If yours is a vegetarian home, the amount is usually sufficient for one to two, depending on your unique eating habits. We harvest on Tuesdays, Thursdays, and Saturdays for pick up those afternoons after 1:00 from the cooler. We immediately field wash and put the vegetables in the walk in cooler to keep fresh as possible. My guarantee is that if you ever use anything from my farm that you do not 100% agree is the most flavorful and fresh, I will replace double the amount of food you didn't like. Some of it will be ugly and not perfect like you see in the commercial stores, but they will not be able to compete with the nutrition and flavor. Some of it will look perfect like in the store, except ours will have all the nutients and vitamins in them. Is that fair enough? Finding out how God does things and following His ways is at the heart of what the biodynamic principles mean to me. At the farm, we plan, plant and manage the growth of our crops in succession so we won't run out. There are times that in spite of all the dedication and prayers, we still mess up with schedules and best intentions. Nature always rules. No matter what plans could have been in place we still have to work in the bounds of the weather, critters, insects, and farmer errors. When this happens there may be less of some crops. Our dedicated members understand the natural processes we work with. Since we replant at regular intervals during the season, what may be lacking one week will show up in future offers. This past year was an abundant year and the members had more than ever before. There were some concerns that they had too much, what a great opportunity. Members are welcome to visit the farm at almost any time -- BY APPOINTMENT! Since I am not always here (I do have other off-farm chores and activities, and some things have to be done on a timely manner) I encourage you to TEXT AHEAD! We also hold volunteer work & fun days, encouraging members to get involved. Hands-on classes are offered at least once a season covering the various aspects of biodynamically naturally grown gardening located at the farm. I strongly urge you to do the garden tour before becoming a customer. I would love to show you the process that your food will be grown, it takes about 30 minutes. We have farm work day on Thursday for about 5 hours where we have some 'class' time and working in the field learning by doing about organically biodynamically farming. We usually have 8-10 coworkers for this day. There is no fee for this session. 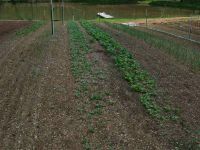 I plant cover crops (green manure), horse manure that is various stages of composting, rotate our vegetable plant locations, and use only natural minerals, compost, herbal, and other organic preparations. I do have thousands of tillers at work in the soil. These workers are the lowly earthworms; you can go to any place in my garden and find 1000’s of them. We are using a new plow this year called a Berta Plow. It does a great job turning the soil. We usually come behind it with a light till to get the planting bed ready. We are incorporating 'no till' as much as we can, this year we have an abundance of partially composted horse manure we will be using as mulch for the transplants. We introduce and encourage habitat for beneficial insects, birds, bats, and other creatures that prey upon unwanted insects. We are not insect free, in fact there is an abundance of good and bad insects. You will notice the wooded habitat around the garden and numerous birdhouses to attract the birds. Frogs are numerous because of the pond, lizards, lady bugs, and spiders help control the flying insects. The wasps help control the larva. The ants help aerate the soil, eat little critters, use aphids to raise their young, help house fungi, and clean up dead critters. We do not spray them with anything but seek to develop a balance. We do occasionally encourage them to go to a different place. They usually get very upset if you mess with their houses. Not much different than what I would do, but I haven't bit anyone in a while :). No matter what I do, there seems to always be weeds. Good plants in the wrong place. I love this definition of weeds: 'they are like teenagers, they only want a place to stay, to eat and find a way to reproduce.' 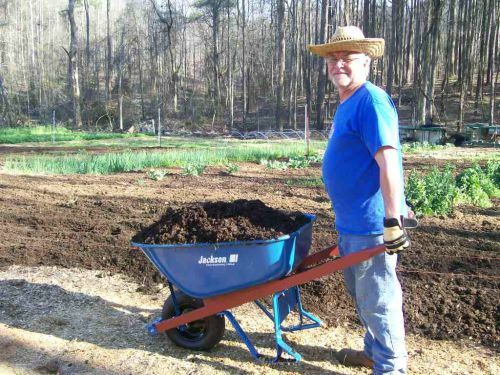 Weeding is done by hand, by hoe, "flaming", composting, mulching, ashing, and other safe practices. This year we are going to experiment with a black plastic and landscape cloth. We hope to use it to control weeds but to also conserve moisture and not have to till as often. We plan to get 2 plantings in it per season. You will notice the overhead sprinklers in the field. This is the primary method of applying water, from either the pond you see out front or well water which supplies our personal residence next door. I only have to use it a few times a year because the mulch and humus in the soil retains the moisture so well. The goal is to treat my plants like you do your children. If you give them a pleasant place to live, provide good wholesome food for them, and make sure they get plenty of 'exercise'; they will stay healthy warding off the unlimited germs and viruses all around them. The same is true of plants, make a healthy soil and they can fight off the diseases. These problems are mostly avoided by my pledge to use sustainable, healthy, environmentally friendly practices. Biodynamically treated with homeopathic teas are as strong as we get. This is always the #1 priority! I use unchlorinated well water to wash all the vegetables. There still may be some small insects and soil on the vegetables. They are coming from a natural environment and are not as ‘sterile’ as in a commercial store. Freshness, variety and the TLC from field to consumer have rewarded us with a favorable reputation in the North Fulton area! It's easy to add photos to your farm description or anywhere throughout your site.